Embattled National Chairman of the APC, Adams Oshiomhole, has spoken out on his ordeal with the DSS, stating that the security agency can not direct him to resign as the party's chair. The National Chairman of the All Progressives Congress (APC), Adams Oshiomhole, says the Department of State Services (DSS) cannot demand the resignation of a party chairman. 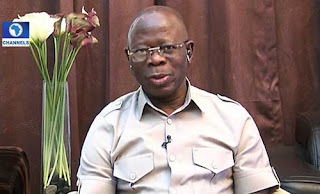 Oshiomhole said this when he made an appearance on Channels Television’s Sunday Politics, in reaction to comments trailing his invitation by the security agency. The comments also followed the alleged plan by some aggrieved governors of the party to impeach him from office. The national chairman of the APC, however, debunked allegations that his invitation by the DSS was linked to any financial fraud case. He said he was not arrested by but was engaged in a routine meeting with the security agency. He said, “We have met a couple of times to discuss issues that have to do with the country, our party, if they have information or if there are certain clarifications they need… we’ve had conversations on a variety of issues. “For the man on the street, I wasn’t hired (arrested) by DSS and I cannot be requested by the DSS to resign or to retain the job. “APC is a structured party, we have organs, I know the processes, we know the procedures and I believe the DSS also understand their own role in the system. “It is not up to them to demand the resignation of a party chairman. If there are issues of finances or issues of fraud or corruption, I don’t think those fall within the purview of DSS. “I think there are established agencies like the EFCC. We even have a whole outfit, the ICPC – whose mandate is expressly to deal with alleged cases of corruption or financial abuses. “The role of the DSS is clear – state security”.